Cincinnati, Ohio – A group of Indiana University East administrators, faculty, staff, and friends of the university attended the Western & Southern Open (WSO) tournament to meet a few of their online students on August 16. The WSO tournament was held at the Lindner Family Tennis Center in Mason, Ohio, located about an hour and a half from the IU East campus. 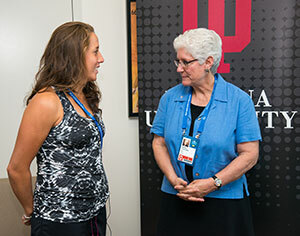 Varvara Lepchenko and IU East Chancellor Kathryn Cruz-Uribe talk about tennis and taking online courses. Lepchenko is a business administration major at IU East. IU East Chancellor Kathryn Cruz-Uribe said visiting the WSO was a great opportunity to meet a few of the university’s online students. IU East and the Women’s Tennis Association (WTA) are now in the second year of an exclusive educational agreement for players which provides the opportunity for the women to continue to professionally train and play while completing their bachelor’s degree online. IU East online degree completion programs offer the high quality of an Indiana University degree to students throughout Indiana, nationally and internationally. IU East offers 13 options for students to complete their bachelor’s degree or certificate online. “Any time we get to meet our online students in person we are very pleased to talk with them about their IU East experience and to know more about them outside of the classroom. 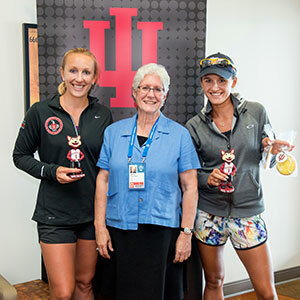 By attending the Western Southern Open, we get to hear directly from our students, the challenges they face and the interactions they have with IU East faculty, staff and students,” Cruz-Uribe said. Lisa Grattan, Women’s Tennis Benefits Association (WTBA), explained that about five years ago they collaborated with the WTA to examine additional ways to help current and alumnae players continue their professional development. As a result, they developed a Transitions program, including earning a bachelor’s degree to be prepared for life after tennis. “Tennis players start playing at an early age and we wanted to make sure we could help them get an education, not just on the court but off the court as well. We’ve all been given so much and it is important for them to be able to give back to the world and to help others. I’m very proud of what our players do,” Grattan said. Through the partnership, 15 of the world’s top 200 players are enrolled in IU East’s online degree completion programs. WTA players have been enrolled at IU East since the spring 2013 term. Varvara Lepchenko is a business administration major in her second semester at IU East. She lives in Pennsylvania and was born in Tashkent, Uzbekistan. Lepchenko talked about her schedule with tennis and her strategies to complete her course work including studying during travel. “Fall is really my best time for classes because my tennis schedule slows down a little bit. It’s a good time for me to study,” Lepchenko said. The start of the fall 2015 semester is Monday, August 24. Many of the players IU East visited with on Sunday continue to take courses through the summer as well. The last day of summer classes was August 17, just as the WSO tournament was starting its main draw and qualifying rounds. Chancellor Kathryn Cruz-Uribe talks with Irina Falconi about taking online courses for her business administration degree. Falconi takes two courses a semester while continuing to play tennis. “I think it is very important to learn something else to have an education to rely on other than tennis,” Lepchenko said. She added that her academics provide more than a reprieve from tennis but add a way to broaden her perspectives and her mind. She said even though she is taking courses online, she has an opportunity to meet other students in her classes through introductions and interactions on assignments. Irina Falconi is also a business administration major. She just completed a new course offered at IU East in fine arts on drawing before the start of the WSO tournament. Falconi said she had no idea that she had a talent for drawing but the course revealed her new talent. Falconi, who lives in West Palm Beach, Fla., said she enrolls in two classes each semester and hasn’t taken a break since she transferred to IU East’s online degree completion program three years ago. The players visiting the IU East suite at the WSO were given a “Rufus the Red Wolf” bobble head (Rufus is the IU East mascot) and sugar cookies in the shape of tennis balls and rackets made by Queen Bee Confections in Richmond. Chancellor Cruz-Uribe met with players while in the suite. She exchanged Twitter handles with Falconi and talked about the number of players in the program as well as how they help each other study or plan their course schedules. Falconi said she recruits other players to the online degree completion program because it is a great opportunity for them. She finished in the quarter final round of the tournament. Falconi was home schooled during high school and she said the online program fits well with her self-teaching style of study. Chancellor Cruz-Uribe had the opportunity to watch a few students as they practiced during her visit to the WSO, including sisters Anastasia and Arina Rodionova. The Rodionovas live in Australia and were born in Tambov, Russia. Practice sessions are held throughout the day during the tournament matches. Anastasia Rodionova and Arina Rodionova are enrolled through IU East’s online degree completion programs. The Rodionovas met Chancellor Kathryn Cruz-Uribe during the Western Southern Open. The chancellor presented the students with a “Rufus the Red Wolf” mascot bobble head. The Rodionova sisters discussed the challenges of taking courses online while maintaining a busy training and international tournament schedule with tennis as well as their personal life. Anastasia is in her second year as a business administration major while Arina is in her first year of business administration. Anastasia finished in the second round of doubles while Arina completed the first round. In June, IU East and the ATP signed an educational agreement for players to complete online degree programs. The ATP is the governing body of the men’s professional tennis circuits – the ATP World Tour, the ATP Challenger Tour and the ATP Champions Tour. With 62 tournaments in 31 countries, the ATP World Tour showcases the finest male athletes competing in the world’s most exciting venues. The next tournament is the U.S. Open, August 31 to September 13.